Air travel in India has grown at a phenomenal rate in recent years. In 2017, the Indian government announced that India had become the world's third largest domestic civil aviation market, with passenger traffic of over 100 million during 2016-17. According to recent projections, passenger numbers are expected to reach 7.2 billion a year by 2034. India also expects to be the worlds largest aviation market by 2026. The expansion is being driven by airport modernization, the success of low-cost carriers, foreign investment in domestic airlines, and emphasis on regional connectivity. Massive upgrades of major airports in India have been undertaken, with the significant input of private companies, and are still continuing as capacity is being stretched. India now has some much improved, glossy new airport terminals. Here’s a summary of what to expect. 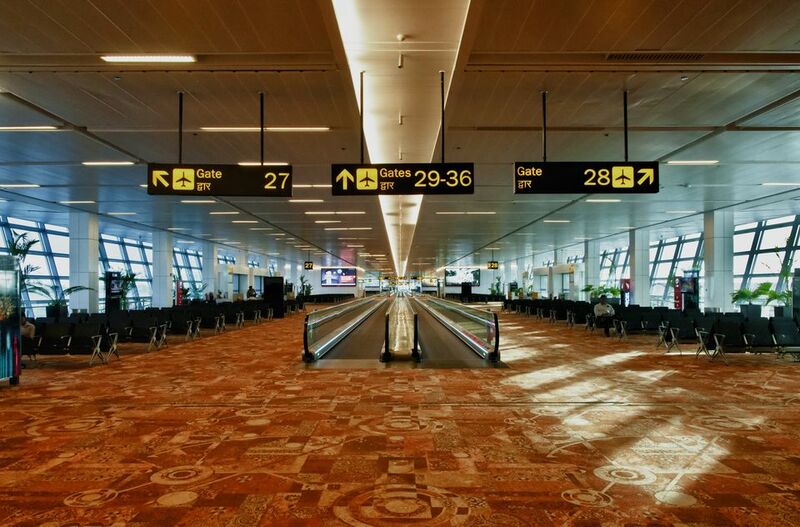 Delhi competes with Mumbai for the accolade of best airport in India. The airport was leased to a private operator in 2006 and subsequently upgraded. Its brand new international Terminal 3 opened in 2010 and doubled the airport's capacity. However, low-cost domestic carriers still depart from a separate terminal. In 2017, Delhi airport handled 63.5 million passengers, making it the seventh busiest airport in Asia and one of the 20 busiest in the world. Another upgrade is currently in process to further expand the airport. The development of the airport includes the construction of an adjacent Aerocity hospitality precinct, with many new hotels. It has convenient access to the terminals and a station on the ​Delhi Metro Airport Express train line (there's also a station at Terminal 3). Unfortunately, Delhi airport is badly affected by fog during winter, from December until February. This commonly results in flight delays and cancellations. Location: Palam, 16 kilometers (10 miles) south of the city center. Travel time to the city center: 45 minutes to one hour, during normal traffic. The road to the airport becomes very congested during peak hours. Mumbai airport handled 47 million passengers in 2017, making it India's second largest airport. Similar to Delhi airport, it was leased to a private operator in 2006, and a new integrated domestic and international terminal constructed. The terminal, known as Terminal 2, opened in early 2014. Domestic airlines are currently in the process of relocating to Terminal 2 in a phased manner. Although the new terminal has greatly improved the airport's functionality, runway congestion and consequential flight delays are still a significant problem. In addition, low-cost carriers still depart from the old domestic terminal, which is inconveniently far away in a different area. Location: The international terminal is located at Sahar in Andheri East while the domestic terminal is in Santa Cruz, 30 kilometers (19 miles) and 24 kilometers (15 miles) north of the city center respectively. Travel time to the city center: One to two hours, depending on the traffic. Bangalore, India's third busiest airport, is privately operated and handled 25 million passengers in 2017. It's a brand new airport that was constructed on a greenfield site. Both the domestic and international terminals are in the same ​building and share the same check-in hall. Despite having low-cost facilities, the main issue is that it's located a long way from the city. The airport terminal opened in May 2008. Since then, it's been expanded in two phases. The second phase commenced in 2015 and involves the construction of another runway and terminal. Bangalore airport often experiences problems with fog early in the mornings during winter. Location: Devanahalli, 40 kilometers (25 miles) north of the city center. Chennai airport is India's fourth largest airport and the main hub for arrivals and departures in south India. It handles almost 20 million passengers a year, about half of which are flying domestically. The airport is owned and operated by the Indian government. It's in the process of being expanded and redeveloped. New domestic and international terminals were built and opened in 2013, and the secondary runway was extended. The second phase of redevelopment is currently being undertaken, including expansion of the new domestic and international terminals, and is expected to be completed by 2021. The old domestic terminal, located between the two buildings, has been demolished to facilitate this. While the airport is functional, unfortunately, its infrastructure is incomplete and it lacks amenities. Possibly, the worst part of this is that the domestic and international terminals are located 800 meters apart. A moving walkway is finally expected to connect the two. A Metro Rail station is also scheduled to open at the airport in 2018. Poor workmanship has caused some safety issues at the airport, with the repetitive collapse of glass panels, granite slabs, and false ceilings in the terminals. Location: Pallavaram, 14.5 kilometers (9 miles) southwest of the city center. Travel time to the city center: 20 to 30 minutes. Kolkata airport is an international airport but about 85% of its passengers are domestic travelers. It's India's fifth busiest airport and handled nearly 19 million passengers in 2017. Like Chennai airport, Kolkata airport is owned and operated by the Indian government. The airport's old domestic and international terminals have been replaced with a much needed new and modern integrated terminal (known as Terminal 2), which opened in January 2013. The airport's modernization resulted in it being awarded Best Improved Airport in the Asia-Pacific Region in 2014 and 2015 by the Airports Council International. New retail stores finally opened at the airport in 2017, providing passengers with something to do. Do note that Kolkata airport is affected by dense fog during the early hours of the morning from late December to early January. This causes regular flight delays. Location: Dum Dum, 16 kilometers (10 miles) northeast of the city center. Travel time to the city center: 45 minutes to 1.5 hours. Hyderabad airport was opened in mid-March 2008. It's operated by a private company and handles about 15 million passengers a year. The airport is world-class, with excellent facilities. In​ a testament to this, it has consistently ranked among the top three airports of its size (five to 15 million passengers) in the world in the Airports Council International's annual Airport Service Quality Awards. Hyderabad airport also won an award for environmental management, in 2015. The airport has a single integrated domestic and international terminal. Works have commenced to expand the airport by adding another terminal and another runway by 2021. Location: Shamshabad, 30 kilometers (19 miles) southwest of the city center. Goa currently only has one airport that services the whole state, and it's situated on a military airbase. The government owned and operated airport has a capacity of 5 million passengers a year, but is handling nearly 7 million passengers. Unfortunately, this is apparent in its functionality. Even though the airport has been redeveloped, with its new integrated terminal inaugurated in December 2013, there have been frequent complaints from passengers about its infrastructure. These include overcrowding, haphazard layout, inefficient procedures, slow service, lack of food vendors and shops, dirty washrooms, and dysfunctional air-conditioning. A new airport is expected to open in Mopa, in north Goa, in 2019. However, works are also planned to expand the existing airport. Location: Dabolim, between north and south Goa. Travel time to the city center: 40 minutes to reach Panjim, the state's capital.